Executive Summary: a simple tool for creating motion blurred images and videos from videos. 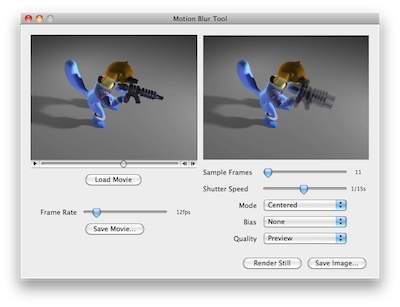 Motion Blur Tool creates a motion-blurred image from an input movie. The ideal input movie has been rendered at a very high framerate. To Use simply load the movie (two examples are provided) pick a position in the movie, and then click "Motion Blur".